Like to hire me as your speaker? Kick! Contribute! Or like & share! We’re 1/2 way to the end, and need a lot more pledged! Let’s go, folks! 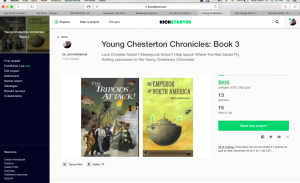 https://www.kickstarter.com/projects/836606559/young-chesterton-chronicles-book-3?ref=creator_nav ….almost made it to the 1st Thousand bucks! Half way there! Let’s make this happen, folks! Tripods has a new Home! Oh, yeah! Prom! And his Grad speech! Ok: Soccer, Treefort, Titus, Prom, Summer!